Just Fair 2011 is my very first original custom card set. It is a set that accompanies the 2011 baseball season. I started this site doing custom cards of sets that already existed and just adding new cards to the sets with different players. I always have wanted to do my own set, for a very long time. I love my design in this set, I came up with it on a Sunday night and have changed almost nothing from that first draft, I just knew it was exactly what I wanted to do. I combined element from some of my favorite sets of all time to form this set. Black border: The last decision for me was a black border or white border, I went with the black border because the foul pole in the card shows up much better. I imagine at some point I will post some of the white “variants.” The black is taken form possibly my favorite Topps set, 1971. Name block: The name block is simple and is a little like1993 Donruss, another set I really like. The two tone color scheme really separates it and makes it readable. Foul pole: The foul pole was an idea I had when thinking of what other sets had done. A baseball has been used a ton of times and occasionally bats have been used. 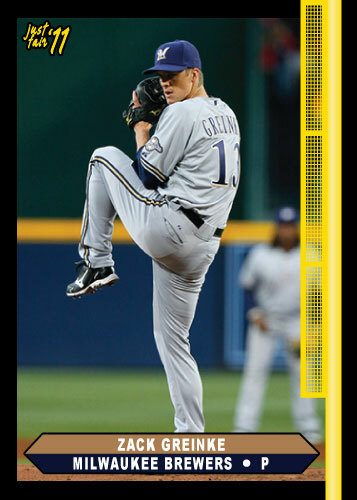 The closest to this is 1989 Upper Deck that had a baseline on the side of the card, a brilliant idea in my opinion but I always thought the baseline looked a little too cartoony. Big picture: Keep It Simple Stupid; I like a big picture of a player, that is after all why the card is interesting. I maximized my picture area by slimming down the border to a minimum width and keeping the name block floating as opposed to docking it against any of the sides, this allows the picture to surround it and seem much larger. Also notice the netting on the foul pole is transparent like it should be. This allows the picture to be seen through the netting on the foul pole, possibly my favorite part about the card design. Logo: I designed a quick logo for my “Just Fair ’11″ set because this is something Donruss and Fleer always did and Topps has done since the late ’70s. I chose a color to match the foul pole on the oppisite side of the card and outlined it in black to keep it readable. I went with a script font to make it seem modern. The year is somewhat separated from the name so if I decide to produce anther set next year, I can simply change the year and go. I would of course vary the design somehow as well.